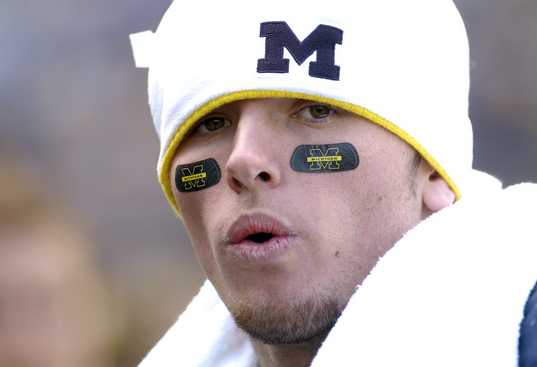 Posted on Sat, Oct 17, 2009 : 7:31 p.m.
Michigan quarterback Tate Forcier chills on the Michigan bench after leading the Wolverines to a touchdown on their opening drive of Saturday, October 17th's clash versus Delaware State at Michigan Stadium. Tate Forcier started Saturday against Delaware State a week after he suffered a concussion against Iowa, but the true freshman lasted just one series as Michigan chose to be careful with its quarterback’s health. “We had thought about” sitting him altogether, Michigan coach Rich Rodriguez said. “But he progressed really well during the week, practiced well Wednesday and Thursday, and he needs some reps. He’s still a freshman, so every rep that he gets is valuable, not only in games but in practice.” Rodriguez said he planned to play Forcier “a few series,” but once Michigan got up 21-0 midway through the first quarter he turned to Denard Robinson. Robinson led four scoring drives in the first half, throwing touchdowns to Kelvin Grady and Martell Webb and running for a 4-yard score. Rodriguez said he intended to get Robinson more involved in the passing game, but did not go to the air in either of Robinson’s first two series. “We wanted to get in there and run some of the passing plays and train him with his eyes and where he’s supposed to look,” Rodriguez said. “I don’t know how many times he threw it. Four? We wanted more than that.” Robinson finished 3-of-4 passing for 85 yards. He’s 10-of-19 on the year with three interceptions and Saturday’s two touchdowns. After Forcier and Robinson took turns leading Michigan's offense to a quick lead, the Wolverines got contributions from quarterbacks further down the depth chart. Nick Sheridan, who started four games last season but had only thrown a couple of passes this year, stepped in and completed seven of nine passes for 88 yards. And David Cone, who quarterbacks the scout team, completed all three of his passes for 54 yards. "It was a lot of fun," Cone said, as fans chanted his name. "I've been feeling good in practice. I didn't know we were gonna get to throw that much, because we were up by a lot." Sheridan, a Saline native, has kept competing despite Michigan's depth at quarterback. While it's unlikely Sheridan will break through as a starter in his final season and a half, Rodriguez said Sheridan has a bright future in football. "We think an awful lot of Nick," Rodriguez said. "He's gotten better, and he's worked hard at it, but he's like a coach for us on the practice field and the game field. He sees very well, he knows our offense, and I think he's going to be a tremendous coach." Even freshman quarterback Jack Kennedy got in at the end of the game for Michigan. "Those guys put the time in, and it's good to see them having fun," Rodriguez said. As far as accolades go, it wasn't the best week for Michigan defensive end Brandon Graham. He was left off the Lombardi semifinalists list, an award given to the best lineman in the country. He wasn't named to one of Phil Steele's three midseason All-Big Ten teams, which means Steele considers him at least the seventh-best defensive lineman in the conference. Graham, though, doesn't care. With Ohio State losing Saturday, it opened up a good portion of the Big Ten. "I'm not worried," Graham said. "As long as we win this Big Ten championship, it don't matter. That's my biggest award for anybody." There is a list that is more important to his future, though. It's the one that begins getting compiled now and then finishes up in April - the NFL Draft list. Against Delaware State, Graham had three tackles, two of them for sacks. And he's being touted as a potential first-round NFL pick by some analysts. So to Graham, that's the list that matters. "Yeah, yeah," Graham said. "That's more important. After we finish this goal, that's the goal." Buried on the depth chart at receiver, James Rogers approached Rodriguez a few weeks ago and asked about a position change. Rodriguez finally acquiesced last week, moving Rogers to cornerback - where he began his Michigan career. With backup J.T. Floyd out with the flu, Rogers got extensive playing time at left cornerback. He finished with one tackle. “He came to me actually a week or two ago and asked and said, ‘Listen, if I can help,’” Rodriguez said. “I said, ‘Well, let’s wait,’ and then this week we thought was a good week to try him. He got a lot of reps, so we’ll see how he did.” With Boubacar Cissoko still serving an indefinite suspension for violating team rules, cornerback is one of the thinnest positions on Michigan’s young defense. Troy Woolfolk moved from safety to corner last week against Iowa, and made his second start opposite Donovan Warren on Saturday. True freshman Teric Jones also saw extensive playing time against Delaware State (1-5), but Michigan kept highly-regarded freshman J.T. Turner on the bench. Turner has not played this year, and is on track to redshirt. “We were very mindful of the guys we plan on redshirting,” Rodriguez said. Michigan played 84 of the 115 players it dressed Saturday, and seniors Zac Baker and Ohene Opong-Owusu made their first-ever appearances. Opong-Owusu was mobbed by teammates on the sideline after making a special-teams tackle in the second half. "He was a captain out there today and this was his game," Graham said of Opong-Owusu. "I tip my hat off for him ‘cause he was hustling every time he was in there. I know he works so hard every day and for him to go out there and get two tackles on the two plays he was out there, that was a good thing for him." Nine freshmen played Saturday: Forcier, Robinson, Jones, Vincent Smith, Je'Ron Stokes, Craig Roh, William Campbell, Vlad Emilien and Mike Jones. One player who didn't get in much was punter Zoltan Mesko. Michigan never punted Saturday. Mesko did hold on extra points. James Briggs and Michael Rothstein contributed to this article. Sun, Oct 18, 2009 : 9:47 a.m. Probably a late replacement in schedule. They would have found out more about their players with an intrasquad scrimmage. But a W is a W.
Sun, Oct 18, 2009 : 8 a.m. I don't think they should schedule games like this, but it was a lot of fun to see all those guys out there. It was definitely better than a bye week. I don't believe they scheduled this type of game on purpose. D.S. was so weak that I don't agree that it made us any better. It was just fun. Sat, Oct 17, 2009 : 11:59 p.m. I think it was a great game to get playing experience for the 2nd and 3rd bench guys and the younger players who don't get to play much during the regular season. This will help build depth for the remainder of the b10 season while keeping our starters fresh. I think UM has the talent on offense to beat all the teams remaining on our schedule. The key will be our defense, hopefully they can continue to improve enough for us to win most of our remaining games. I didn't think we had a chance against OSU a few weeks ago, now I'm thinking this will be the year we finally beat them and end the drought. Sat, Oct 17, 2009 : 7:51 p.m. I agree that it was good to see a lot of the reserves play today who usually don't get to play and I'm glad the starters showed up and played well while they were in there. However, this win somehow feels like a half a win because it was against such a much smaller school that isn't big enough to be in the same qualifying division. Who's on tap for next year's bye week game? Indiana State? Perhaps Southern Illinois or Western Illinois? I'm not suggesting that U-M should schedule USC or Texas or anybody like that for a game in the middle of Big Ten play, but to schedule this type of team is not very dignified. I think it was designed to get an easy win to pad the record a little to be in a better position for a bowl, pure and simple. Sat, Oct 17, 2009 : 7:27 p.m.
typical tater... too scared to play with the big boys.